Detail : Paul's thirteenth solo single. This incarnation featuring : Paul, Linda, Denny Laine, JImmy McCulloch and Geoff Britton. The track was remixed by Alan Parsons, shortening the intro and ending, plus he pushed the organ higher in the mix. 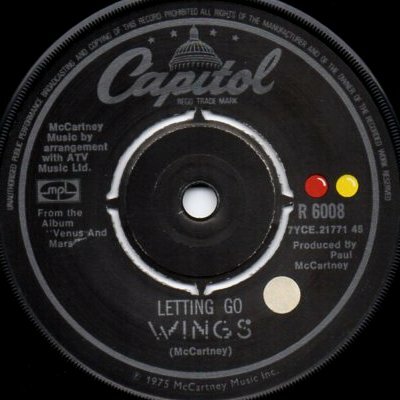 It has been said that McCartney's vocal was made "drier" in this version. This single was released to try and boost sales of "Venus and Mars", but as you can see from the chart position above, it didn't really help ! The single was not released in a picture sleeve, and once again appears to be on Capitol.